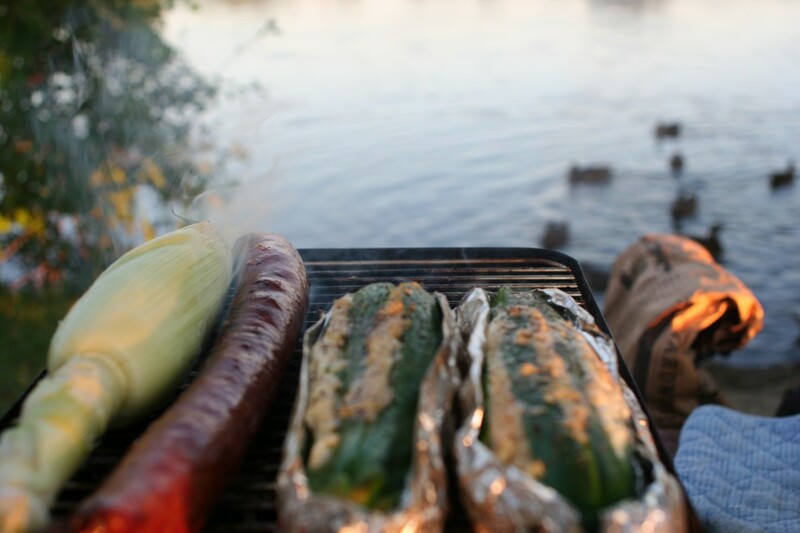 Before we delve into the Cali trip we thought we’d share some of our favorite new grilling recipes. 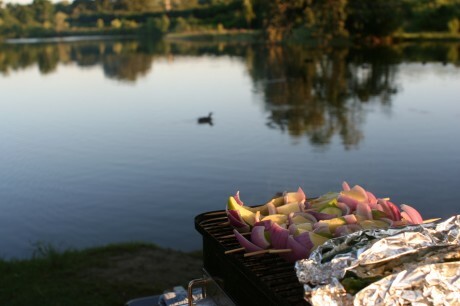 This summer we’ve had some great grill-outs with friends and family and hope you can enjoy some of these recipes before it gets too cold. My surprise birthday party (planned by Bourbon) was one of such grill outs and the recipes come from a BBQ book a friend gave me that day. Directions: 1) Cut 2 pieces of foil, each large enough to enclose one of the zucchinis. Brush foil with olive oil. Cut a few flits along the length of the zucchini and place on foil. 2) Insert strips of feta along the slips and drizzle with olive oil. Season with pepper. Fold in the sides of the foil to reinforce the edges. 3) Bake the packages in bbq embers for 30-40 minutes. Directions: Soften the butter and mix in the above ingredients. Directions: 1) Cut the onion into wedges and place in a large shallow nonmetallic dish with cheese and apples. Mix the oil, vinegar, mustard, and garlic together and season to taste with salt and pepper. 2) Pour the marinade over the onions, apples and cheese, and toss to coat Cover and marinate in refrigerator for 2 hours. 3) Drain the onions, cheese and apples, reserving the marinade. 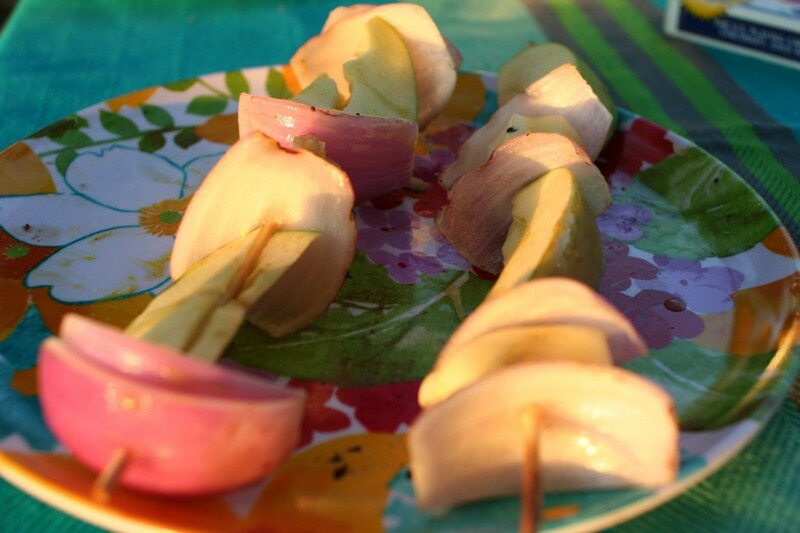 Thread the the onions, cheese and apples alternately onto skewers. Cook, turning and brushing frequently with the reserved marinade, for 10-15 minutes. Serve immediately. And although its not technically a recipe, later in the summer we bid adieu to a set of friends over a picnic in the park. 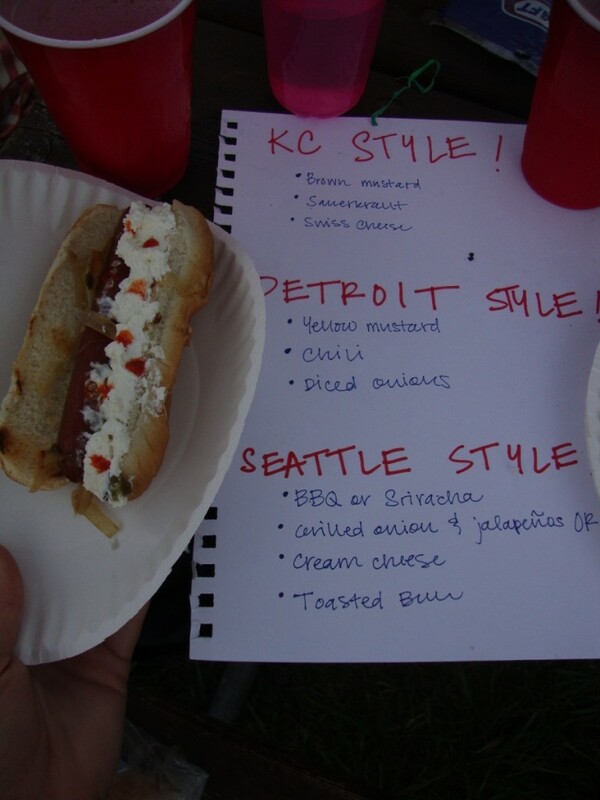 These friends, being the very clever people that they are, supplied the makings for hot dogs in three different styles. The styles the chose were based on their home state, the state they were leaving and the state they were moving. They were delicious, see the picture below for the toppings for each style. Personally I quite enjoyed the Seattle style dog, the cream cheese and sriracha added the spice and cream I was looking for.